Drawing a lot of positive feedbacks during its first release last January, the Jordan Brand are set to release two more colourways of the Jordan Sky High Retro, which are both late additions in the February lineup, but it is expected to impress this February. 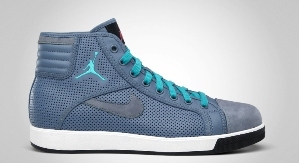 Featuring its well-known elegant design and superb performance-based qualities, the Jordan Sky High Retro will be released in White/Orion Blue-Tech Grey and Ocean Fog/Chlorine Blue-Spark-Gridiron –two colourways that would absolutely catch the attention of the sneaker lovers. Like the previous colourways if this shoe, the two new releases this month would arguably be an instant hit in the market so watch out for it and grab one immediately! Two New Editions Jordan Flight TR ’97 OUT this February!